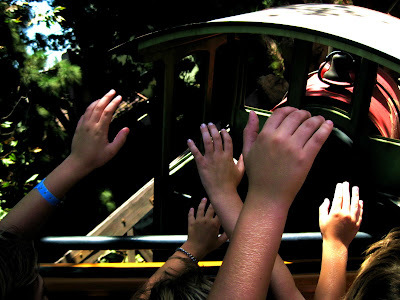 For the last several years we've gone to Disneyland on the last day of summer vacation. The Park is always empty since the schools in both Anaheim and Los Angeles have already started, and it's just our little district that is late to start. We head for home in the late afternoon in time to see the classroom assignments posted at 5:00 p.m. on the school gate. 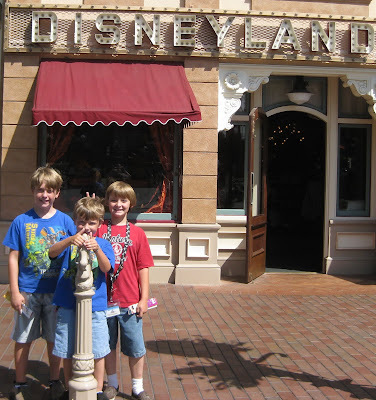 This year I had the pleasure of bringing my friend Cassi's son, Jake, who also has a Disneyland Annual Passport. It was fun to bring along a friend for my boys to play with. 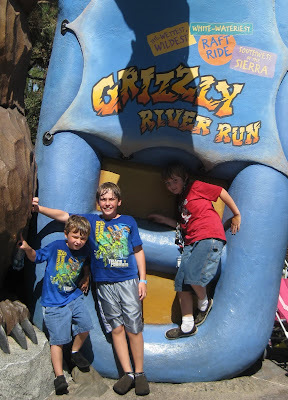 For our very last ride we went on the Grizzly River Run, a whitewater rafting attraction. Normally I despise water rides and make Michael take the kids. There is just nothing worse than spending the day walking around in wet clothes! 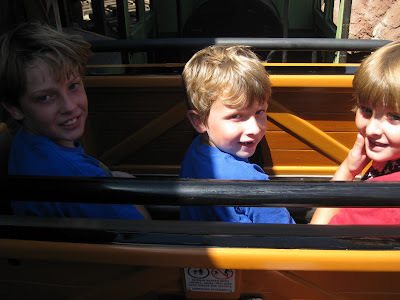 But since it was the last ride of summer, and because poor Michael was working instead of playing with us at Disneyland, I gave in to the three pleading boys. We made it through most of the river with just a few sprinkles. And then as we rounded toward the very end of the ride, our raft went over a huge geyser that shot up in the air and then poured down on us for about 20 seconds. To put it bluntly, we got hosed! The boys were thrilled. I was not! We waddled and dripped our way out to the car and back home in time to find out who the boys got for teachers and then put them to bed nice and early. What a great way to bid farewell to Summer Vacation! Thanks for coming along with us, Jake! Looks like you guys had a great day!!! By the time you got to my house - you were dry so I thought you were kidding that you got drenched... but according to that picture - you weren't kidding at all!! Thanks so much for taking Jake.... he had a great time!! !